This Catholic T-shirt has the prayer: “St. 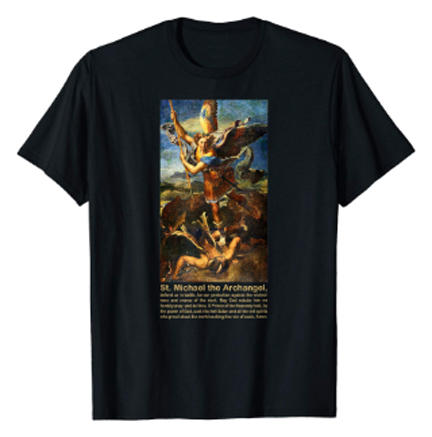 Michael the Archangel, defend us in battle, be our protection against the wickedness and snares of the devil. May God rebuke him we humbly pray; and do thou, O Prince of the Heavenly host, by the power of God, cast into hell Satan and all the evil spirits who prowl about the world seeking the ruin of souls. Amen.” Available in 5 colors (black, royal blue, cranberry, dark heather, and heather blue) in sizes for men, women, and children.